Harrogate, Windsor Court prestigious central location in this stunning part of Yorkshire. Windsor court was looking to convert office space into residential roof top apartments, Moduloft was the perfect solution. Projects like this have many challenges, they needed little disruption to Winsdor Court as many businesses operate from there and whilst trying to develop into combined Residential and Commercial space, it was vital that existing business and resident would be not be disrupted too long. Moduloft offer modular factory build, which was perfect and not too far from Windsor Court. Moduloft skills to develop bespoke living space was key as both apartments were to have different layouts, with one having a split level between living space and bedrooms. Two bespoke self-contained luxury apartments to include 3 bedrooms, 3 ensuite bathrooms, open plan kitchen/dining/living space. 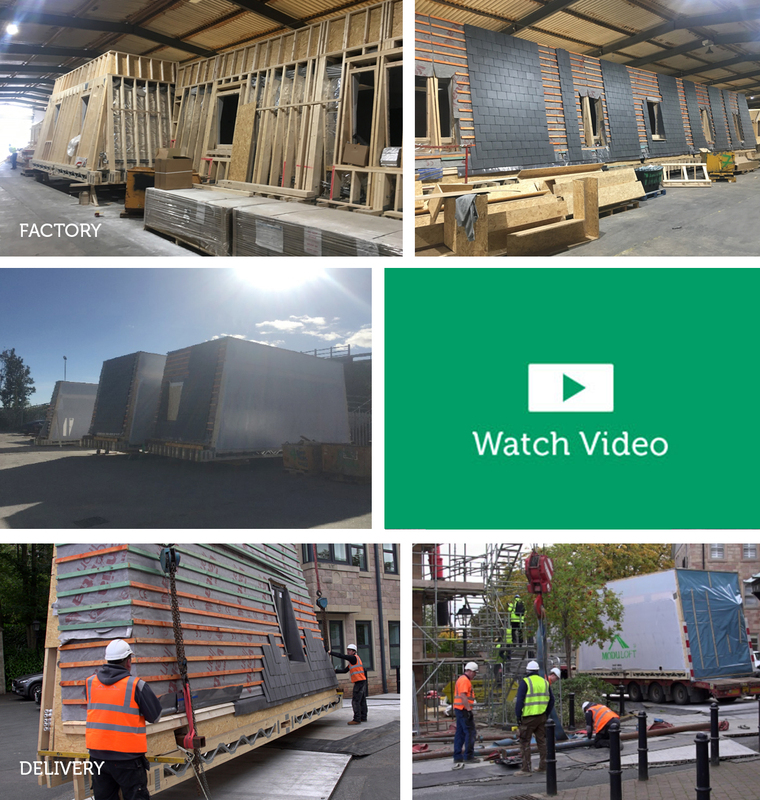 True to form and another advantage to offsite build, Moduloft do as much as they can during factory build to again reduce time onsite, both apartments to have gas central heating systems with smart heating controls. Fully fitted out with the client’s lighting design, apartment entry systems ready to go for security and roof windows throughout to give maximum daylight. The external finish was vital to the design of a stunning mansard roof with natural slate roof tiles and inset lead dormers, the roof to also have a Victorian style metal roof trellis to align to common features used on properties in central Harrogate. 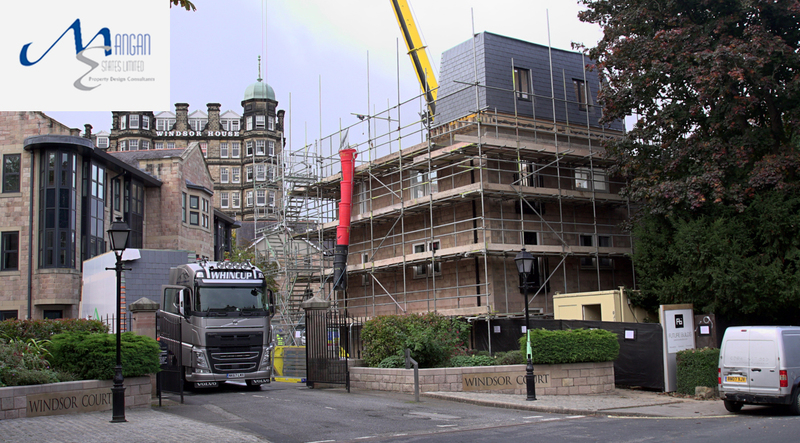 The individual units weighed in at up to 7 tons, this meant a specialist crane had to be employed to facilitate the lift that is fully managed by Moduloft’s experienced team. 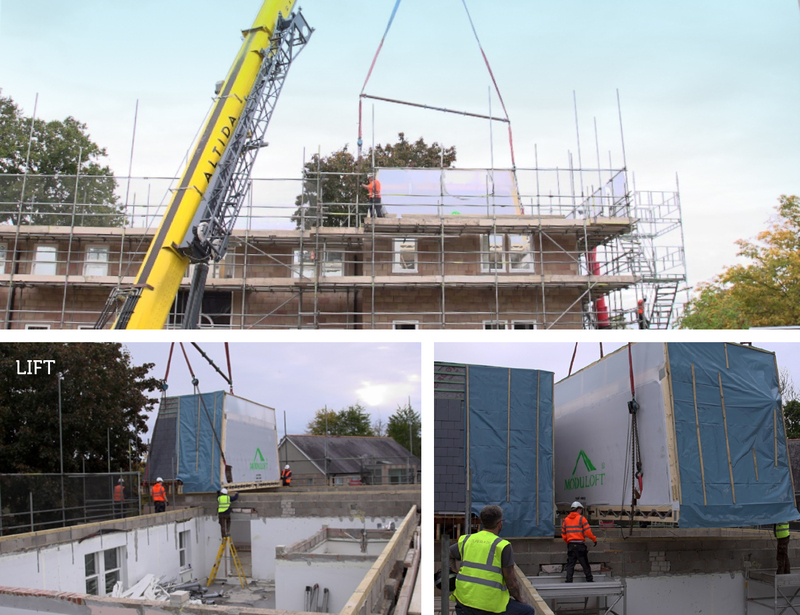 There were 17 modules in total to lift and create the 2 apartments. A lift schedule of this scale meant that planning and precision was key onsite to not disrupt residents and also businesses within Windsor Court. We carried out the lift over 2 days and the modules were then all in place and watertight. Our install team was then on site for a few weeks to complete interior space and connect up the modules. This was a fabulous project for the Moduloft team and one that defines our skill at applying our unique system to a specific commercial project that had many challenges, but none that we couldn’t work to.